There are a number of misconceptions in the market regarding aluminum and fiberglass shelters. Experience tells us in applications including oil & gas, water pumping and purification, and in numerous pump cover applications where fiberglass is commonly used, these myths are particularly widespread. You want to make the best decision for your project and equipment, so in the interest of informed decisions, we'll tackle these myths and more one-by-one below. Aluminum shelters are designed to withstand heavy snow and wind loads. Our standard line of enclosures go through rigorous testing to be ASSE 1060 certified. Any enclosure that is ASSE 1060 certified meets the same minimum requirements for strength. 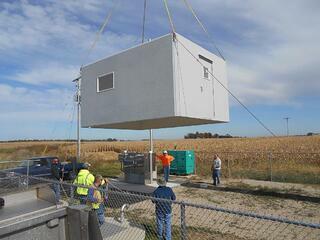 So, like any comparable fiberglass shelter, aluminum enclosures will be more than strong enough for your application. Safe-T-Cover's aluminum shelters are made of marine grade 5052 aluminum which has good resistance to corrosion, especially in salt water environments. There is also 3003 aluminum, which would be a good option for hydrogen sulfide applications. 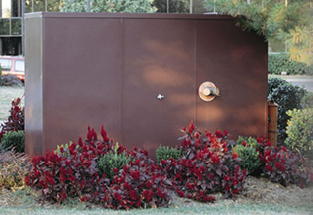 However, fiberglass enclosures are necessary for environments where chlorine is present as aluminum is not recommended. If you hit an aluminum shelter with a baseball bat, a dent is possible. However, we’re not aware this type of vandalism is commonplace. A more common situation would be if a car hits the enclosure. In this case, aluminum may dent, but fiberglass may shatter. If an aluminum enclosure is dented, the integrity of the shelter is not compromised and it won’t rust. Also, if the aluminum enclosure manufacturer uses a modular design, replacement panels are inexpensive to buy and easy to replace. Depending on the insulation used by the manufacturer, the R value of an aluminum shelter is as good if not better than a fiberglass shelter. There are different types of insulation from polyisocyanurate boards to a spray-foam insulation. Each has an individual R value, which changes depending on the thickness. 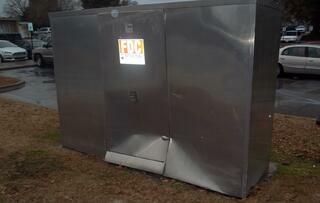 Be careful of fiberglass enclosures that use spray-foam insulation, as it can fall off. Our aluminum enclosures are available in 30 colors and the material is the same as used on metal roofs installed all across the US. They are known for low maintenance long lasting color. The company we use is Pac-Clad and here's a colorful example of their work. You don't need to worry about adherence or re-treating the shelters. 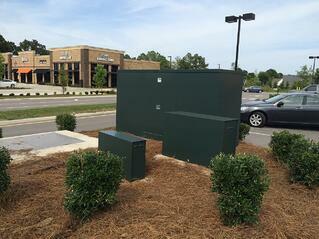 Unlike fiberglass enclosures, an aluminum shelter requires grounding. This is a simple process, and as the electrician told us, all it takes is a ground rod and a strap. An aluminum shelter will likely weigh a bit more than a fiberglass shelter. At most, it might weigh a couple of hundred pounds more. This means it will be heavier to ship than fiberglass. However, since it can be shipped flat, this still saves on freight compared to a large, assembled fiberglass enclosure. Aluminum shelters require a conventional concrete pad for installation, the same as the fiberglass shelter. Both types of enclosures require the same amount of maintenance. That's to say, they are basically maintenance free for their typical lifespan of 25+ years. Aluminum enclosures have been in the market just as long as fiberglass shelters. Some of our enclosures are going on 30 years. As our company ages, we'll find out just how long they last. You can safely plan on your aluminum shelter to be fully functional after 50 years in the field. The aluminum enclosure won't break down due to the sun, wind, rain, or temperature. The warranty for an aluminum shelter is 1 year, typical for materials and workmanship on a construction project. Since there is nothing on an aluminum shelter that can fail, there is no need to offer a longer warranty. The cost of ownership for an aluminum shelter and a fiberglass shelter is the same. Both are maintenance and worry free. The only additional cost consideration would be for a heater if your equipment requires freeze or frost protection and the power to maintain that heater. The covers themselves require no ongoing cost. An aluminum shelter is shipped flat in a box and can be easily assembled by two workers in less than half a day. Here's a video of two of our staff putting one together. They're old pros and weren't mounting it to a slab, so it only took them about 5 minutes. Conventional tools are all that’s required and we send easy to follow instructions for our covers. On the other hand, for a fiberglass shelter, it may be shipped as an assembled single unit. That may sound easier to install, but really it means you'll need a crane to lift and place it. Our experience tells us an aluminum shelter is a stocking model, it can ship the next day. Custom enclosures are typically shipped within four weeks. Fiberglass shelters may take twice that long, as you can see on this FAQ for a leading fiberglass manufacturer. So the next time you hear about the promoted advantages of a fiberglass shelter, ask yourself if those claims matter for your project. Always consider which material will be best for your equipment and specific needs. If you need a cover to withstand a caustic environment including chlorine, definitely choose fiberglass. If you're basing your decision on most of the rest of this list, you can see that each performs well and has it's own strengths. As we’ve pointed out, for almost any application, the aluminum shelter will get the job done.